at 7 pm. Tickets at £6 from Stratford Circus Box Office on 0844 357 2625 or from www.stratford-circus.com. 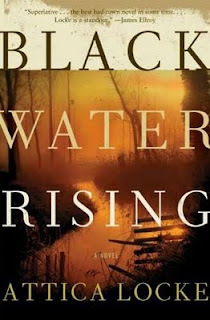 Reminiscent of early John Grisham and Walter Mosley, Black Water Rising is a taut, fast-paced novel heralds an exciting and powerful new voice in fiction. Big oil and corporate corruption meet their match with Jay Porter, a personal injury attorney down on his luck, who suddenly finds himself in a situation spiralling out of control. Jay knows a boat ride on the Bayou won’t measure up to his wife’s expectations of a birthday celebration, but it’s all he can afford. Halfway through dinner, gun shots and sharp cries for help ring out. When he fishes a woman out of the Bayou, he knows that this charitable act will lead to no good. Unravelling the woman’s past, Jay finds himself enmeshed in a web involving greed, politics and corporate corruption. And the secrets of his own past come back to either haunt or save him. Attica Locke is a screenwriter who has worked in both film and television for over ten years. She was a fellow at the Sundance Institute’s Feature Filmmaker’s Lab and most recently completed an adaptation of Stephen Carter’s The Emperor of Ocean Park. She is currently working on a television series about the civil rights movement, based on the writings of historian Taylor Branch. Born in Houston, Texas, and named after the uprising at Attica prison in 1971, she lives in Los Angeles.